C&V Group has two companies that one is Dalian C&V Technology Co., Ltd and the other is Nanjing CV-HS Autoparts Co., Ltd. Nanjing CV-HS Autoparts Co., Ltd an axle manufacturer and we are mainly supply bus axle , engine and transmission. Nanjing CV-HS Autoparts Co., Ltd., an axle manufacturer which has an annual production capacity of 30,000 pcs (15,000 sets) of axles, covering a total area of 40,000 square meters, of which structure area is 20,000 square meters, is located in a superior geographical position of Nanjing Lishui Economic & Technological Development Zone. Nanjing CV-HS Autoparts Co., Ltd. is the first domestic enterprise which specially focuses on the research and manufacture of bus axle using advanced equipments and testing instruments imported from America, Korea, Taiwan, etc. Through the introduction, digestion and absorption of progressive technology of axles from S&T Dynamics Co., Ltd. and Hwa Shin Co. Ltd. in Korea, Nanjing CV-HS Autoparts Co., Ltd. has created its own product range of bus axles with independent intellecture property, mainly including front and rear axle for low-floor buses, front and rear axle with drum/disc brake for 12m buses, front and rear axle with drum/disc brake for 11m buses, tagging axle, covering all series of 6m – 12m medium and large buses. With the orientation of high-end market of bus axles, “C&V bus axle” is the standard product for domestic luxury buses, which major clients are Jinhua Young Man Automobile-Manufacturing Co., Ltd., Beijing North Huade Neoplan Bus Co., Ltd., Anhui Ankai Automobile Co., Ltd., Guilin Daewoo Bus Co., Ltd., King Long United Automotive Industry (Suzhou) Co., Ltd., Anhui JAC Coaches Co., Ltd., Shanghai Wanxiang Automobile Co., Ltd., and other bus makers. 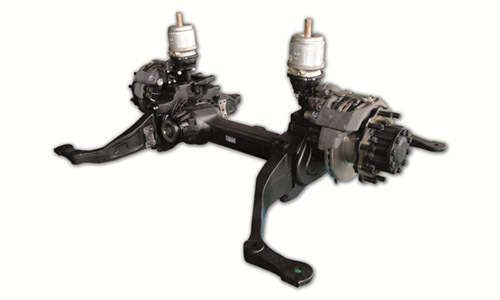 We supplied our front and rear axle assemblies to domestic large bus makers, which successfully superseded those made in Korea and partially superseded those made in Germany and USA. With the growth of export business of domestic buses, “C&V bus axle”, along with the vehicle or by OEM, has exported in batches to over 30 countries and regions, such as Russia, Korea, Australia, Malaysia, Jordan, Chile, Argentina, Taiwan, etc. “C&V bus axle”, a perfect combination of internationalization and localization, has been accepted and chosen by more and more bus makers and end users for its high cost-performance. With the mission of “Focus on bus axle, create value for customer” and the orientation of our business guideline of “Character enhances product, product forges Brand”, we will be continuously doing our utmost to promote our product and service to make “C&V bus axle” as No. 1 Brand in the line of China’s Auto Industry.